When the America on the Move team began exploring the universe of stories that could be told in the exhibition, one that kept surfacing was containerization—the technological and operational revolution that transformed the way cargos are loaded and moved among ships, trains, and trucks. We embraced this topic, for it not only involves all three modes of surface transportation, but containerization’s impact on global commerce in the last quarter of the 20th century can hardly be overstated. (In the year 2000, the value of containerized cargos entering and leaving United States ports totaled more than $600 billion.) While we agreed that the topic had to be included, the task remained to pinpoint the time and place for the container story setting. 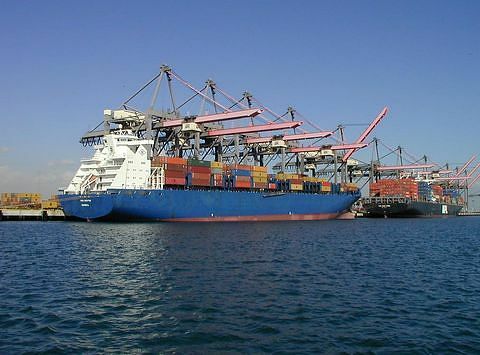 In 2002, the Port of Los Angeles and the Port of Long Beach were the top two U.S. ports for containerized exports and imports, handling 7,244,000 TEUs (twenty equivalent units-a 20 foot container is one TEU; a 40 foot container is two TEUs). McLean's concept of global, integrated truck and ship transportation is illustrated in this 1966 Sea-Land Services brochure. We started where most histories of containerization start—with Malcom McLean, the North Carolina trucking magnate, who speculated that he could load lots of his trailers onto a ship and send them by sea for less than the cost of trucking them overland. 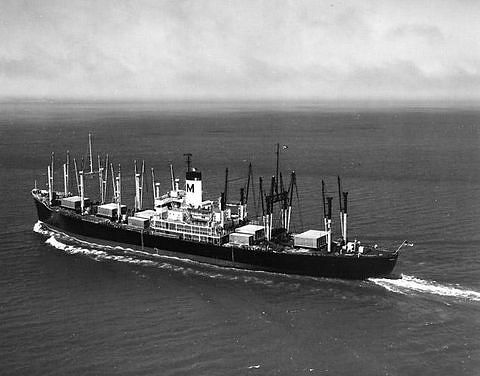 McLean is credited with shipping the first load of containers (truck trailers) aboard a cargo ship, from New Jersey to Texas, in 1956. McLean’s idea grew into Sea-Land, the giant intermodal transportation company. Our research also led to a collection of oral history interviews that had been assembled by historians Arthur Donovan, of the U.S. Merchant Marine Academy in King’s Point, New York, and Andrew Gibson, a former maritime administrator and assistant secretary of commerce for maritime affairs. Between 1995 and 1998 Donovan and Gibson interviewed people who had been involved in the early development of container technology and operations. 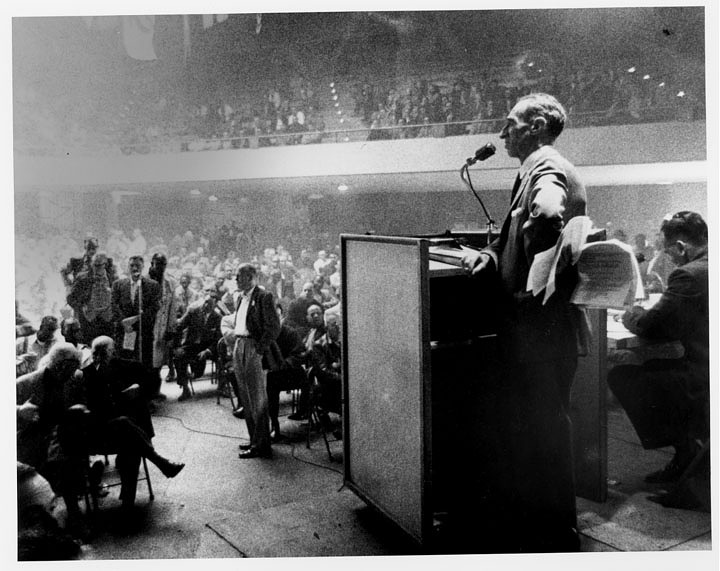 Their project, supported by the Smithsonian’s Lemelson Center for the Study of Invention and Innovation, resulted in a collection of audio tapes and transcripts, housed in the Museum’s Archives Center. As we examined the material, it became clear that there was a lesser known but equally compelling story about the early days of containerization on the West Coast. The interviews and various published sources pointed to the Matson Navigation Company, a shipping firm based in San Francisco since 1882, as a key player in the development of containerization on the West Coast. Matson’s engineers were among the first to focus on designing and testing containers, cranes, and other specialized equipment. The company also recruited operations and systems specialists from the oil and automobile industries to conceptualize containerization as a multi-modal network, not simply as ocean transport. 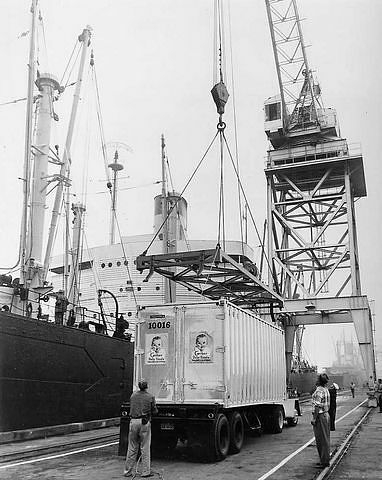 Loading the first container for Gerber Baby Food aboard the Hawaiian Merchant at Alameda, Cal., August 31, 1958. This was Matson’s first shipment of containerized cargo. The case for locating the container story on the West Coast was strengthened by other factors as well. Settings in America on the Move are meant to immerse visitors in a specific time and place, a moment in history when something changed or something out of the ordinary happened—when a transportation issue divided a community, a conflict simmered, a good idea was embraced, the unintended consequences of a decision were revealed, a community’s identity was tested. The introduction of container technology was one such “moment,” and the response by longshoremen of the West Coast’s ILWU (International Longshoremen’s and Warehousemen’s Union) had all the ingredients of a good story—conflict, charismatic leaders, money, and more. Harry Bridges, who had led the union since its founding in 1937, realized that the container revolution was inevitable. 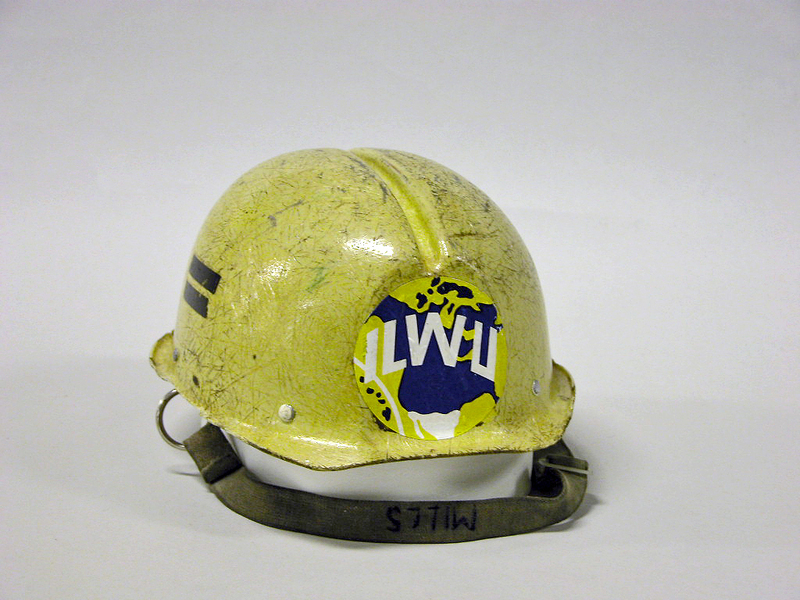 On behalf of the ILWU, Bridges negotiated a labor agreement that was meant to compensate longhoremen for lost jobs and wages resulting from containerization and other mechanized cargo-handling techniques. In the 1960s and ’70s, longshoremen were concerned that they would be replaced by container-handling machines. Local 10 longshoremen Herb Mills (left) and Peter H. Brown working in the hold of a ship, 1960s. Longshoremen, working in container yards and in the holds of modern freighters, wear hard hats for protection. Herb Mills credits this hat with saving him from serious injury. 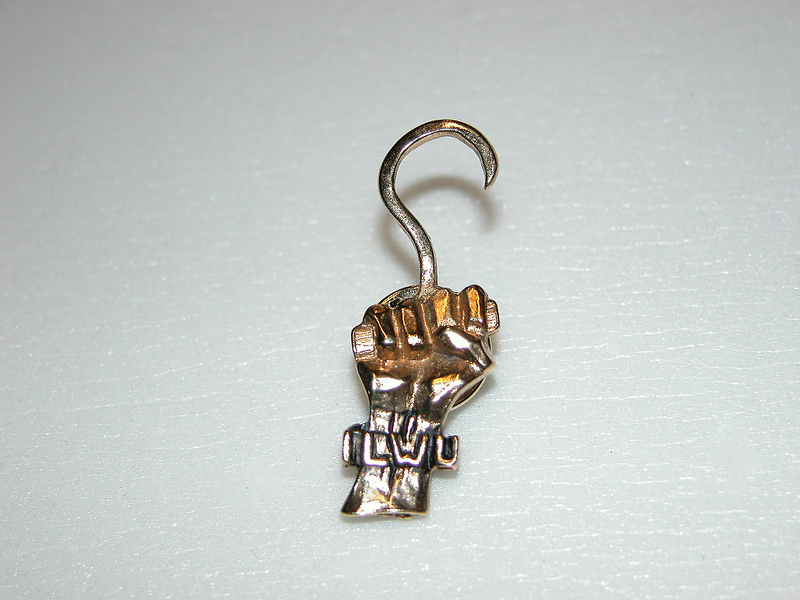 The fist and cargo hook logo was adopted by ILWU longshoremen who voted to strike in 1971. 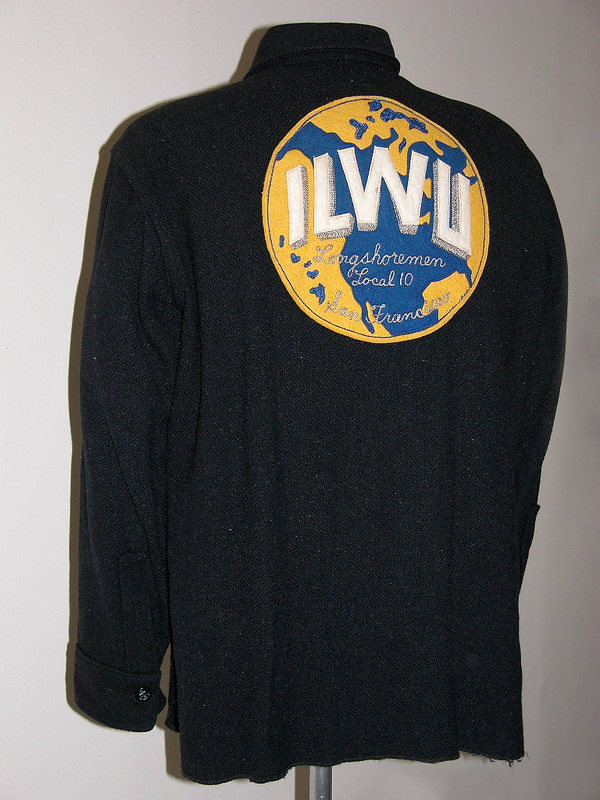 Since then, the logo has been widely used as a symbol of the ILWU and appears on pins, clothing, and posters. At the same time, the impact of containerization on ports and their physical surroundings—the maritime landscapes—played out in unexpected ways in the San Francisco Bay area. Less than a decade after containers were introduced, Oakland was second only to New York in the volume of containers handled among world ports. San Francisco lagged behind and never challenged Oakland’s position as the primary commercial port in the bay area. 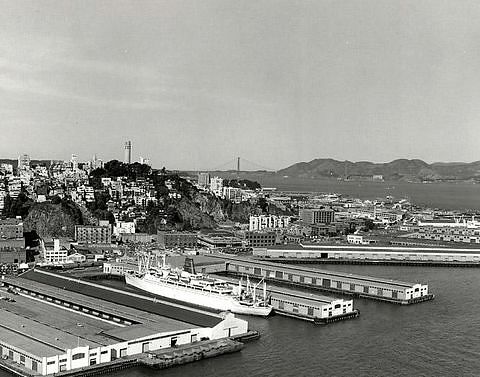 San Francisco’s hilly landscape, heavily developed waterfront, and historic finger piers were not conducive to container port development, which required large expanses of open, flat ground. 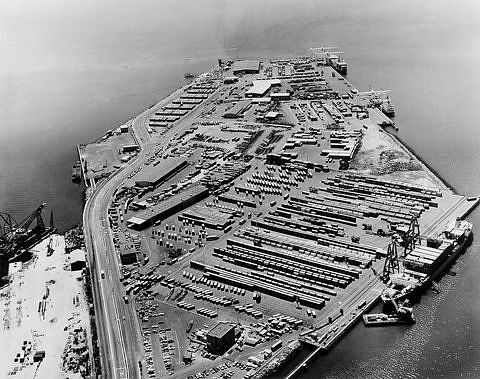 The Port of Oakland attracted shipping companies by developing container facilities on filled land near the western terminus of the Southern Pacific Railroad. The port’s links to major rail and road networks proved superior to those on the San Francisco side of the bay. After several months of research and weighing of alternatives, we decided to locate the America on the Move containerization story in the West. With strong material from Matson Navigation, the ILWU, and the Port of Oakland, the time and place for the setting would be San Francisco and Oakland, 1960-1970. The majority of settings in the exhibition are built around large vehicles from the Museum’s collection. With the container story, however, we knew we would have a problem with scale: even if we had one in the collection, a containership was simply not going to fit in the hall. Or in the Museum. So we focused on the next best thing—full-sized containers—believing they would help suggest the scale of the hardware involved in the container revolution. We set out to locate some containers of the right vintage and contacted the Matson Navigation Company for assistance. Eventually, three old Matson containers were found at the Port of Long Beach, where they were being used for storage. In March 2002, we visited the port to assess their suitability. This photograph shows one of the 1970s aluminum shipping containers that was refurbished and donated by the Matson Navigation Company for display in the "Transforming the Waterfront" section of "America on the Move." It was being stored at the Matson Terminal in Long Beach, California, prior to its restoration. 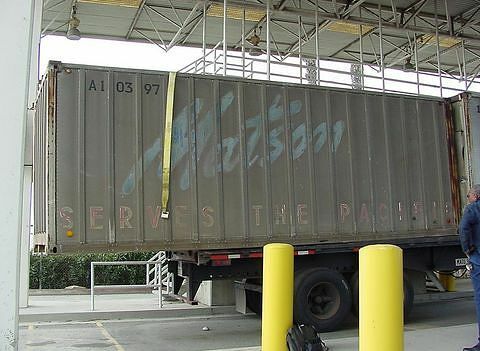 The Matson Company agreed to repair and refurbish the containers to our specifications and had them transported to Modesto, California, where the work was done at American Metal Fabricators. This photograph is one of a series documenting the preparation of several 1970s-era aluminum shipping containers for display in "America on the Move." This view shows two men preparing the surface of the aluminum on one of the container sections. This photograph is one of a series documenting the preparation of several 1970s-era aluminum shipping containers for display in "America on the Move." This view shows four members of the restoration team with the container sections in various stages of preparation. This photograph is one of a series documenting the preparation of several 1970s-era aluminum shipping containers for display in "America on the Move." This view shows Ed Stephens, Manager of Mechanical Engineering at the Matson Navigation Company, reviewing plans with curator Paula Johnson. Stephens managed the container restoration project. This photograph is one of a series documenting the preparation of several 1970s-era aluminum shipping containers for display in "America on the Move." This view shows George Oeser (on ladder) attaching a "Trailmobile" logo to the back door of one of the container sections. This photograph is one of a series documenting the preparation of several 1970s-era aluminum shipping containers for display in "America on the Move." This view shows the final touches of dark blue paint being applied to the "Matson" name on the face of one of the container sections. This photograph is one of a series documenting the preparation of several 1970s-era aluminum shipping containers for display in "America on the Move." This view shows one of the finished container sections being lifted onto a truck for transport across the country to Washington, D.C. This photograph is one of a series documenting the preparation of several 1970s-era aluminum shipping containers for display in "America on the Move." This view shows four members of the restoration team standing in front of the completed container section. This photograph is one of a series documenting the preparation of several 1970s-era aluminum shipping containers for display in "America on the Move." This view shows the container pieces at the National Museum of American History on the morning of May 5, 2003, after having traveled 2,831 miles from Modesto, California. From January to May of 2003, a team of engineers, metal workers, painters, and all-around good folks in Modesto, California, restored to Smithsonian specifications three 1970s shipping containers for the "America on the Move" exhibition. The project was supported by the Matson Navigation Company and was carried out at American Metal Fabricators, in Modesto. The three shipping containers had been manufactured around 1970; they each measured 24' x 8'6" x 8'6" and were made of aluminum. While they had served their original purpose of carrying goods of all sorts between the West Coast and Hawaii, they had spent at least a decade at the Matson terminal in Long Beach, where they had been used by the company for general storage. The object of the restoration was to make the containers look as they might have looked around 1971, as if they had been across the ocean a few times. 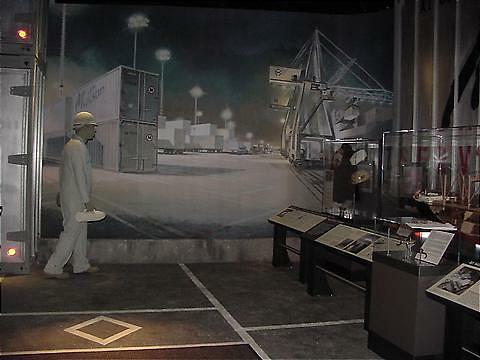 The restored container sections were delivered to Washington, D.C., and installed in a section of the exhibition that evokes the container yard at the Port of Oakland, about 1970. Once we had decided to use the containers, we began planning how they would be arranged in the setting. Because part of our story would address the shift of container operations from San Francisco to Oakland during the 1960s, it made sense to locate the setting at Matson’s new container facility at the Port of Oakland, which opened in 1968. 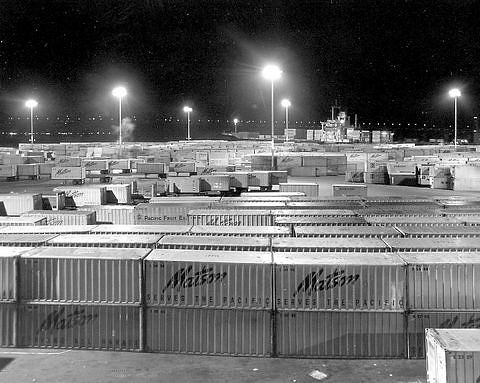 Matson’s container yard at the Port of Oakland, about 1970. This image of the yard at night helped inspire and inform the setting in the exhibition. 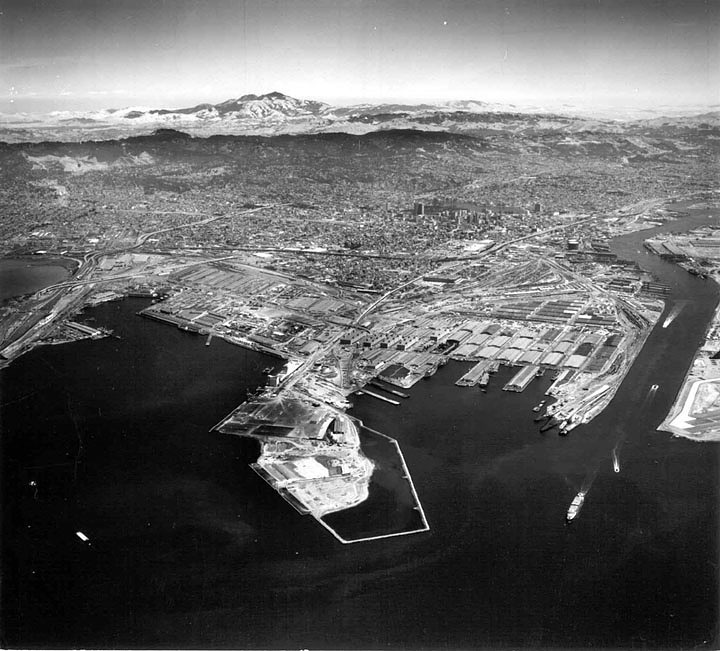 This aerial view of the Matson terminal in Oakland, about 1973, shows the relationship between the cranes, the storage yard, and intermodal links (the railroad runs along the left side of the facility). The cast figure in the nighttime setting shows a longshoreman walking across the container yard toward the crane in the distance. A ship is being unloaded at the pier. The longshoreman is a middle-aged, African American man who is dressed in coveralls, work boots, and a hardhat, typical working clothes for a crane operator. His gloves are in his back pocket—they’re not the thick gloves worn by longshoremen for handling barrels, boxes, and bales, or for lashing containers together. They’re thin and leather, and may not be needed at all for driving the crane. The operator is carrying a thermos of coffee. Retired ILWU Local 10 longshoreman Herb Mills helped us develop the details of this cast figure. He suggested we show the crane operator, who represents the new world of longshore work that was ushered in by containerization. The crane operator works alone in the cab, high above the ship, in surroundings that contrast sharply with the gangs of men who labored together in the holds of break-bulk freighters. This longshoreman is “turning to,” or about to start the night shift at the crane controls. That he is African American reflects Local 10’s membership beginning in the 1960s, when a significant number of blacks were brought into the local. This cast figure was made for the section on containerization in "America on the Move." It depicts an African-American longshoreman dressed in coveralls, work boots, and hardhat. He is meant to represent a longshoreman working as a container crane operator in Oakland, California, about 1970.